A pottery hound with naturalistically modelled features, depicted seated on an irregularly shaped flat base. The dog looks straight ahead, with his front legs placed sturdily on the base. It has finely defined, somewhat doleful facial features, pendant ears, wide open eyes and a mouth drawn into a reserved expression. The dog is solidly potted and covered in an ochre pigment. A dog (gou) is among the twelve signs of the Chinese zodiac and is one of the oldest domesticated animals in the Chinese world. According to Chinese mythology, after the first ‘Mother’ and ‘Father’ (Nuwa and Fuxi) created mankind, they created the dog before all other animals – which is said to be the reason why the radical form of ‘dog (quan)’ is so common in written Chinese characters. Domestic dogs in China are descended from five ancient types: the spitz, sheepdog, greyhound, pariah, and mastiff. The greyhound, which is probably the type of dog represented here, is shown in stone reliefs of the Han dynasty (206 BC – 220 AD). Elegant hounds have long been associated with high rank and status. 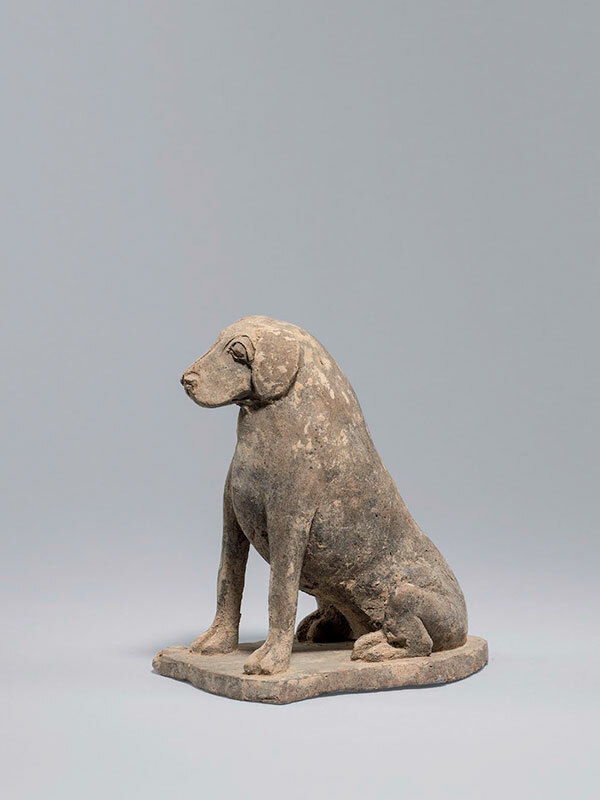 Two comparable pottery dogs, one in a similar seated position and the other reclining and licking its front paws, were excavated from a Northern Wei dynasty tomb in Datong county, Shanxi province, and are now in the collection of the Datong Museum (fig. 1). Two Northern Wei painted pottery dogs, each reclining on a flat base with paws crossed and tails curled to one side, are in the Meiyintang collection. A comparable model of a recumbent dog with a puppy is in the collection of Anthony M. Solomon. Two dogs in crouching position are respectively in the Museum of Far Eastern Antiquities, Stockholm and in the collection of Sir Alan and Lady Barlow.